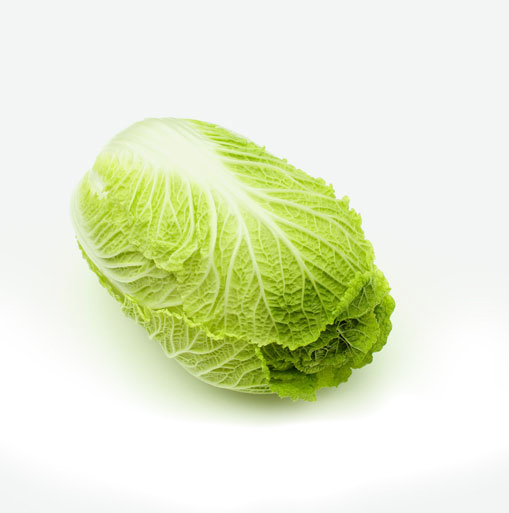 Napa cabbage has a long history of use both as a food and a medicine. It was developed from wild cabbage and is believed to have been brought to Europe around 600 B.C. by groups of Celtic wanderers. The plant forms a head with leaves and petioles when matured. This vegetable is very tender and delicious. Like bok choy, Napa cabbage is a common ingredient in Asian stir-fries, and can also be used as a milder and more delicate alternative to green cabbage in slaws and other recipes. A head of Napa cabbage is a good source of vitamin C and folate (folic acid), which helps with fatigue and is an important nutrient for pregnant women. Napa also contains cancer-fighting phytochemical compounds called indoles, which help to fight free radicals in the body and help fight certain cancers. A head of Napa cabbage should be tightly furled and heavy; the edges of the leaves crisp and moist. Keep unwashed Napa cabbage in a plastic bag in the refrigerator for up to four days but remember it’s more perishable than green cabbage. Rinse the cabbage well just before cooking. Raw: Napa, shredded and tossed with julienne carrots and red bell pepper, lightly dressed in your favourite dressing, makes a delicious coleslaw. Sautéing or Stir-Frying: Heat a small amount of extra virgin olive oil or broth in a large nonstick skillet. Add garlic and chopped fresh ginger and cook one minute. Add sliced Napa and sauté until tender-crisp, about five minutes. It can also be sautéed along with some pork belly, bacon or low-fat ham and potatoes for an unusual take on the Irish dish colcannon. Simmering: Slice or shred Napa into a pot of simmering chicken or beef stock along with other vegetables such as onions, celery, or parsnips and some long noodles to make a substantial soup. Drop the cabbage into the pot during the final five minutes of cooking time. Steaming: Slice Napa and place in a steamer over a pan of simmering water. Cook three to five minutes until crisp tender. Serve tossed with some sautéed garlic and extra virgin olive oil.